This just in, there has been a major quake hitting a 6.7 on the Richter scale north of Tokyo early Thursday (remember that Japan lives in the future by one day hence the awesome technology). 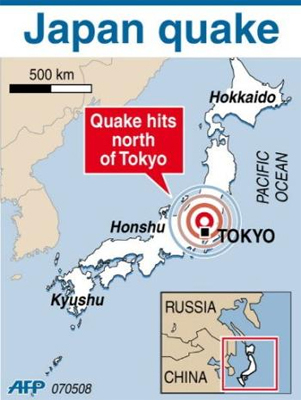 The quake was around the Ibaraki and Tochigi prefectures north of Tokyo where as in Tokyo it measured a 5 on the scale, enough to crack holes in weak buildings. Mothra has not been sighted so everyone seems to be okay. Boom! Shake shake the room.